There was a tremendous buzz of excitement as the children came into the hall for assembly this morning. After months in the making, our very own custom-made curtains are here! 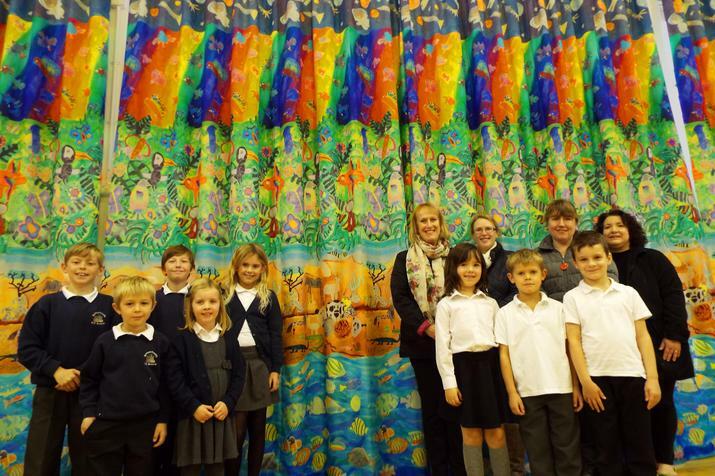 The curtains include artwork from all the children in the school, with each section made up by one of the classes. The designs begin at the bottom with sea creatures by Team Titan, then animals by Team Phoenix, above which are trees and birds by Team Unicorn. The upper part of the curtains shows off hand-print birds made by the Nursery, with scenes from outer space, planets, aliens and astronauts at the very top by Team Dragon. The children were delighted to see their art displayed in such a colourful and prominent way. Our PTA have done a fantastic job in raising funds to support this project, and their contribution to the cost of the curtains has meant the difference between having plain functional curtains and being able to bring these to life with the children's own work. Members of the PTA joined us for our special assembly, in which the curtains were ceremonially closed for the first time by former school governor Mrs Nami. Mrs Nami said to the children "What a wonderful privilege to have such beautiful curtains that you yourselves have designed. We are perhaps the only school in the country to have our very own artwork on our curtains. Maybe one day some of you will become fabric designers!" After the assembly, children gathered eagerly to get a closer look. They were commenting on the origin of different animals, the species and where you'd find them in the world. "There's so much to this design. It's really rich with ideas, and there's enough here to be able to teach whole sections of the curriculum - about rainforests, geography, the environment, space, weather and so much more." added Mrs Nami. Thank you to our PTA for their fundraising, and to Sanderson's Interiors for creating and installing the curtains from the children's designs. And a special well done to Isobel for threading on the curtain hooks to help with the final installation! A fantastic result! Enjoyment and learning in the snow! Team Dragon and Team Unicorn at Eureka! Hampsthwaite CE Primary School is part of Yorkshire Causeway Schools Trust, a charitable company limited by guarantee registered in England and Wales with company number 7663935.